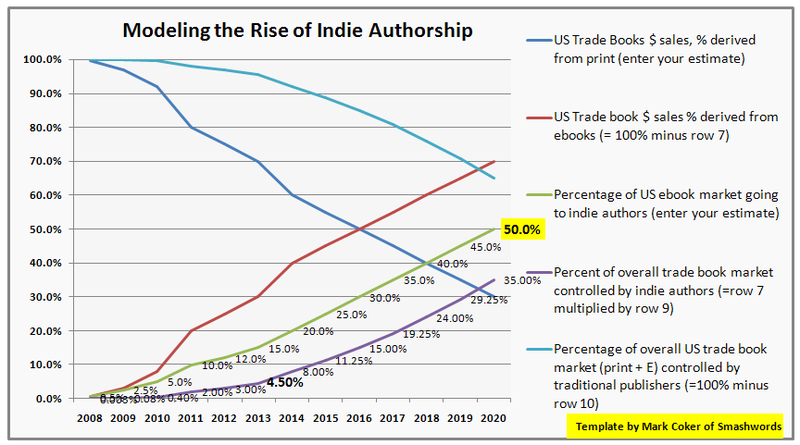 In my post last week I predicted indie ebook authors would capture 50% of the US ebook market by 2020. Today, I'm looking at the implications of this from another angle - author earnings. Hugh Howey has recently lavished some welcome attention on this question at his AuthorEarnings.com web site (I examined the resulting uproar at Hugh Howey and the Indie Author Revolt). One of the commonly cited advantages of indie ebook publishing is that indies earn much higher "royalty" rates than traditionally published authors. Smashwords authors typically earn 60-80% of the list price, versus traditionally published authors who earn 12.5% to 17.5% of the list price. The rate paid by the publisher depends on whether their publisher is selling books under the wholesale or agency models. Let's put some numbers on the bones of these percentages. A Smashwords-distributed author earns $2.40 on a $3.99 ebook sold through one of our retailer partners, whereas a traditionally published author would earn about 50-70 cents. In order for the traditionally published ebook author to earn the same $2.40, their ebook would have to be priced between $13.71 and $19.20. This explains why talented authors are feeling such strong economic incentive to go indie. Indies can price their product lower, but still earn more per unit sold than they can earn from traditional publishers who overprice their books yet continue to offer a small royalty percentage. The chart at the top of this page is generated off of the same estimates that created the chart at left which I first shared in last week's post. The chart at top was created by multiplying the percentage of the market going to indie ebook authors (at left) by 60%, and the percentage going to traditional authors by 15%. These percentages are approximations based on the spreads I mentioned above. You can download my spreadsheet to develop and share your own estimates. Nothing would make me happier than for someone with better numbers to prove that my 2013 indie ebook market share estimate of 15% is too high (it would mean Smashwords authors have more upside in the future!). I am confident, however, that the 10 winds of change I identified in the last post will lead indies to capture increased market share in the years ahead. What's initially striking to me from the new chart at the top of the page is that 2014 could be the first year that the total dollars earned by indies at retail will equal dollars earned by traditional authors. 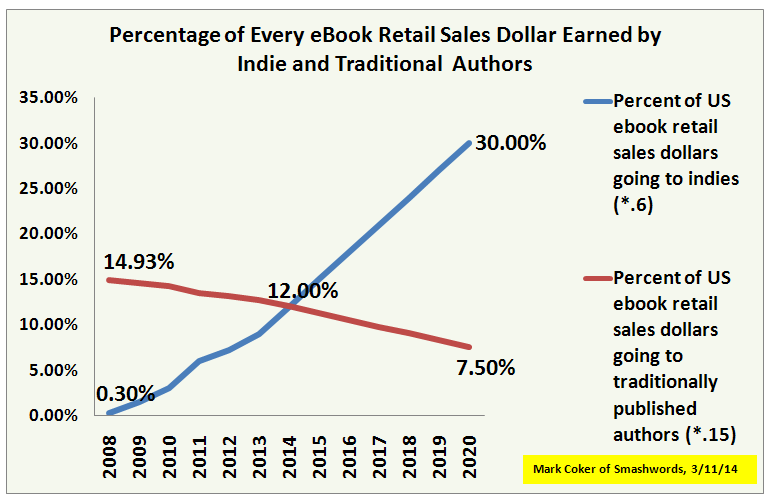 For 2020, the indie ebook community could earn almost four times more than the traditionally published ebook community will earn if indie ebook authors achieve the 50% market share I predict. The next most striking thing is the slope of the curves. Note how steep the slope is for indie authors. The linear market share growth I modeled for indies in last week's chart leads to a bigger differential in this week's chart in terms of the dollars going into indie authors' pockets vs. traditional authors' pockets. In plain English, for every retail dollar that shifts to an indie ebook, the author earns 60 cents. For every dollar that goes to a traditionally published ebook, the author only earns 15 cents. My charts and assumptions are not without their limitations. My numbers don't attempt to incorporate unearned advances, for example. It's common for publishers to pay authors advances that are never earned out by book sales. In such situations, the stated royalty percent underestimates what the author earned (it also represents a failure of the publisher to accurately estimate the commercial potential of a book). An additional limitation of today's chart is that I'm assuming the current royalty rates stay the same. This is a dangerous assumption. If Amazon lowers ebook rates like it lowered Audible audiobook rates the other week, Amazon would break my model and break the banks of many authors. Or, traditional publishers could heed the call of writers to increase their ebook royalty rates. Or, everyone could raise royalties. My projections paint a picture of an indie author community poised to capture an ever-larger share of ebook profits if print continues to decline in importance. But this does not mean that indie authorship is the road to riches. 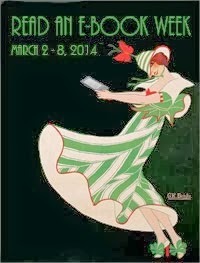 The rise of self-published ebooks will lead to a glut of high-quality books that never go out of print. These books, combined with the ebook releases of traditional publishers, will accumulate on ebook retailer shelves and lead to more high-quality ebooks competing for a limited number of reader eyeballs. It means readers will become more discerning. 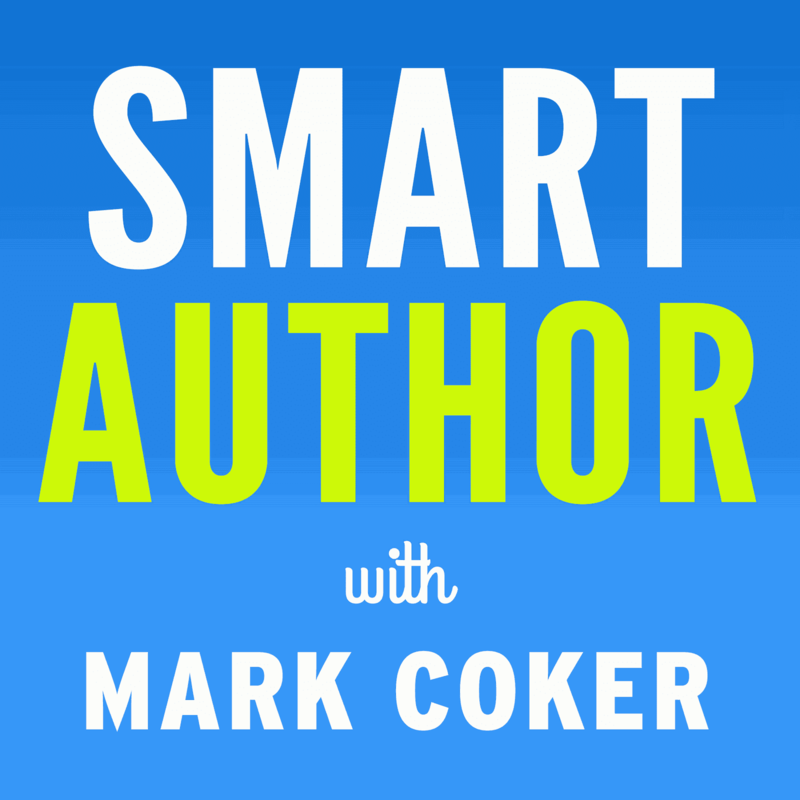 It means all authors - indie or otherwise - will face more intense competition than ever before. Good books aren't good enough anymore. Readers want wow books. Indies will deliver. Mark, I was a bit surprised by the degree of vitriol in some of the posts criticizing Hugh's findings. Have you experienced anything like that, especially since your efforts with the indie movement began way back when? Great acknowledgement to the unknown and being (emotionally) prepared. Am hoping you'll be doing an update post re Scribd too. Thanks, Mark, for more stimulating and helpful remarks. You're a gem! One suggestion. As an author, I'm frustrated by the fact that there's no easy way for me to link potential customers to all of my books, print and digital, at all the major retail outlets. It'd be great if someone would host webpages that'd take a book's primary ISBN and offer a page that provides users with links to where that book is on all the major online retailers. And yes, it is possible to create an HTML boilerplate that'll do that for most of them. I figured out that code for most retailers. Simply insert an ISBN and it'll find the book. But creating, checking and maintaing that would be a big headache. I'd be happy to let someone else do that and earn the associate fees. One less worry for me. Smashwords would be my ideal host. It would mean that a potential buyer's first stop would be the one who pays the best royalties. And even it they go on to Amazon (boo, hiss), they've at least been made aware that Smashwords does exist. They may come back later. It's something to think about and would fit well with Smashword's author-centric business model. Hi Jason, I too was surprised by the vitriol pointed Hugh's way. I think anyone who attempts to uncover and share data should be encouraged, especially when there's so little data to be had. Each piece of information he releases is another useful data point. I view our annual survey results the same way. All these surveys in isolation are data points. In isolation, these surveys are prone to inaccuracy, but that's okay. In the aggregate, they begin to paint a picture of where things are headed. The critics who want to nit pick this or that or attack Hugh are missing the bigger picture. We've been on the receiving end of our fair share of negativity, but surprisingly it hasn't come from big publishers. It's come from writers, especially in the early days. I remember authors emailing me in 2008 with comments like, "There's no way I'm going to allow my book to be listed alongside the unprofessional amateur dreck on your site!" We still get that from time to time from people who don't understand our mission and how we can help them. I have some amusing stories I might share some day. Some of the heaviest negativity pointed our way came from Amazon supporters. I received a lot of heat for my warnings against KDP Select exclusivity - views I still stand behind. @Adan, Scribd has been live with our books for almost two weeks. Right now our friends at Scribd are working to create a system to allow Smashwords authors to receive their free one-year subscriptions. @Inkling, it's a good idea. I think you'll see us do something like that eventually. For example, we'd like to provide retailer links on Smashwords book pages so customers would have the option to purchase the book at their favorite retailer. Please find a way to cull works in the public domain from the Scribd Content ID System. I have received a series of notifications that copies of the texts of legislation and Supreme Court Decisions are documents that are owned by you. These documents have been forcibly removed from my website through no fault of my own and I am having to prove my innocence over and over. Please fix this by suggesting to Scribd they come up with a two tier system, works that fall under copyright, and those that do not. Your graphs are very enlightening and uplifting. Ive been with both Amazon and Smashwords for two years now, and while I spend a lot of time on social media, my royalties remain fairly low. I received the Scribd free trial membership email today and signed on to the site tonight, but without success. I'll try again tomorrow during business hours. I do want to thank you for providing Smashwords publication without cost to authors. Be well. Great article Mark! Revolt of the indies indeed! And I'm ever so grateful that I discovered that SmashWords upped the file max to 10mb! I'm a comic book publisher and the old 5mb limit was just simply impossible for us to cram into... But now that is all changed for us. As long as SmashWords keeps their book sales program they will continue to be a huge force for indies everywhere. I loved Graphicly, but feel that they abandoned their indie roots for corporate dollars and investors that do not understand the nature of indie publishing.